Alzheimer's & Dementia Weekly: Does Sleep Apnea Cause Alzheimer's, Or Is it the Other Way Around? Does Sleep Apnea Cause Alzheimer's, Or Is it the Other Way Around? Research has long connected sleep apnea and Alzheimer's. A key study looking at Alzheimer's and sleep-disordered breathing (SDB) is opening up new "chicken-or-egg" questions: Which comes first? Just who is causing what? An important study looking at sleep-disordered breathing (SDB) and markers for Alzheimer's disease (AD) risk in cerebrospinal fluid (CSF) and neuroimaging adds to the growing body of research linking the two. But this latest study also poses an interesting question: Could AD in its "preclinical stages" also lead to SDB and explain the increased prevalence of SDB in the elderly? "It's really a chicken and egg story," said Ricardo S. Osorio, MD, a research assistant professor at NYU School of Medicine who led the study. "Our study did not determine the direction of the causality, and, in fact, didn't uncover a significant association between the two, until we broke out the data on lean and obese patients." When the researchers did consider body mass, they found that lean patients (defined as having a body mass index <25) with SDB did possess several specific and non-specific biomarkers of AD risk (increased P-Tau and T-Tau in CSF, hippocampal atrophy using structural MRI, and glucose hypometabolism using FDG-PET in several AD-vulnerable regions). Among obese patients (BMI >25), glucose hypometabolism was also found in the medial temporal lobe, but was not significant in other AD-vulnerable regions. "We know that about 10 to 20 percent of middle-aged adults in the United States have SDB [defined as an apnea-hypopnea index greater than 5] and that the number jumps dramatically in those over the age of 65," said Dr. Osorio, noting that studies put the percentage of people over the age of 65 with SDB between 30 and 60 percent. "We don't know why it becomes so prevalent, but one factor may be that some of these patients are in the earliest preclinical stages of AD." According to Dr. Osorio, the biochemical harbingers of AD are present 15 to 20 years before any of its currently recognized symptoms become apparent. The NYU study enrolled 68 cognitively normal elderly patients (mean age 71.4±5.6, range 64-87) who underwent two nights of home monitoring for SDB and were tested for at least one diagnostic indicator of AD. The researchers looked at P-Tau, T-Tau and Aβ42 in CSF, FDG-PET (to measure glucose metabolism), Pittsburgh compound B (PiB) PET to measure amyloid load, and/or structural MRI to measure hippocampal volume. Reduced glucose metabolism in AD-vulnerable regions, decreased hippocampal volume, changes in P-Tau, T-Tau and Aβ42, and increased binding of PiB-PET are recognized as markers of risk for AD and have been reported to be abnormal in healthy subjects before the disease onset. Biomarkers for AD risk were found only among lean study participants with SDB. These patients showed a linear association between the severity of SDB and CSF levels of the biomarker P-Tau (F = 5.83, t=2.41, β=0.47; p< 0.05) and between SDB and glucose hypometabolism using FDG-PET, in the medial temporal lobe (F=6.34, t=-2.52, β=-0.57,p<0.05), the posterior cingulate cortex/precuneus (F=11.62, t=-3.41, β=-0.69, p<0.01) and a composite score of all AD-vulnerable regions (F=4.48, t=-2.11, β=-0.51, p<0.05). Lean SDB patients also showed smaller hippocampi when compared to lean controls (F=4.2, p<0.05), but no differences were found in measures of amyloid burden such as decreased Aβ42 in CSF or PiB positive scans. Dr. Osorio and his colleagues are planning to test their hypothesis that very early stage preclinical AD brain injury that associates with these biomarkers can lead to SDB. They have proposed a two-year longitudinal study that would enroll 200 cognitively normal subjects, include AD biomarkers and treat those patients with moderate to severe SDB with continuous positive airway pressure, or CPAP, over time. 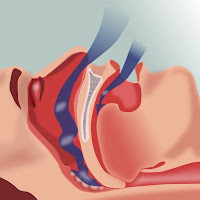 "Sleep Apnea Skyrockets in the Elderly"
The purpose of the new study would be to determine the "direction" of causality between SDB and preclinical AD in elderly patients. After an initial assessment, the patients would be given CPAP to treat their sleep apnea. After six months, they would be evaluated again for biomarker evidence of AD. "If the biomarkers change, it may indicate that SDB is causing AD," explained Dr. Osorio. "If they don't change, the probable conclusion is that these patients are going to develop AD with or without CPAP, and that AD may either be causing the apneas or may simply coexist with SDB as part of aging." Either way, Dr. Osorio believes the relationship between SDB and AD deserves further study. "Sleep apnea skyrockets in the elderly, and this fact hasn't been given the attention it deserves by the sleep world or the Alzheimer's world," Dr. Osorio said. "Sleep particularly suffers from an outmoded perception that it is an inactive physiological process, when, in reality, it is a very active part of the day for the brain." Sleep is a very well natural process for restoration of cognitive injuries at the early stage of dementia. However if an incident that caused a damage at the spine, sooner or later you'll get stuck with sleepless nights whatever you take. Since the spine is the main corridor for nerve sensation & blood supply up and down throughout the body. In order to verify, you can easily find some tiny signs that exist in the body of patient, e.g. some nails grows crooked spontaneously on extremities, sclerotic finger or toe, leg muscle spasm during false-sleep nights, pain at the jaw, molar, neck, back, arms, carpal tunnel syndrome happens very often. It seems a heart attack is imminent, but actually not. Overall, the vascular system is being blocked. Those symptoms appear together time after time, rather suspect of heart attack, you must be careful to pay more attention on the brain as it will get damaged in time. A severe damage of curvature or physical attitude at the sites of neuron - the sacrum - the house of nerves. Configuratively, our feet are the rudder that is powerful enough to carry the strong force to stimulate the nerves at the sacrum and so on the signal goes up to the engine at the mid of spine where the fire shoots up the sensation to the neck and utto the cerebellum, the more corrective movements you make the more sensation will be generated. Under the recreational process for 5 to 10 years mainly on exercise under sunshine without interruption through the years, the brain power of memory will be turning back to normal and eventually the process of breaths and qualitative sleeps will be underway to resuming. This is a truthful experience. All good luck to you too. Let me briefly tell you that there are multiple forms of dementia - alzheimer’s disease being the most common one that accounts for 40 to 75% of dementia cases and is the sixth leading cause of death in United States. Additionally, dementia and its types have common signs with some variations. Let’s start with the most common signs of dementia most commonly seen in patients at the early stages of the disease. They start experiencing subtle memory loss, mood instability such as immediate occurrences of maniac (laugh) and depression (sadness) episodes, and have trouble with listening and explaining things to other people, communicational obstructions to be exact. They also segregate their selves from social gatherings and unions, face difficulty in performing daily chores and also experience muscle impairment. Additionally, some people fail to converse with other people because they fail to keep up the pace and comparatively take longer to process the coming words and repeat the same question over and over again. Most of the cases showed that, dementia patients start segregating their selves and start living alone because they could not keep up with the lives of normal people. They just are not up for the adaptation to change. In one of the form of dementia, which is Lewy Body dementia, probable signs appear to be sleeplessness. Patients experience insomnia which leads to mood swings. It has been seen that they fail to keep tracks of roads and lose their tracking skills as well. In case of Alzheimer’s, a patient the most common signs are memory loss and forgetfulness. In some cases, it has been observed that people with Alzheimer’s segregate their selves from others. Additionally, they experience complete memory loss and trouble understanding visual images and spatial relationships, lack the judgement skill and a complete withdrawal from work or social activities. One most commonly observed is the forgetfulness and inability to retrace steps. There is another type of dementia called Parkinson’s characterized as uncontrollable movement of body parts such a shaking limbs and fingers. It has been observed that patients experience writing and speech changes, their ability to respond fails badly and they lose posture and balance. One of the common sign is bradykinesia characterized as slow body movement. One thing to keep in mind before labelling someone as a dementia patient is that forgetfulness and memory loss do no really mean a person has dementia because memory loss and forgetfulness are a normal parts of aging. But if any severity has been observed in these signs, a patient definitely requires a professional advice and consultation. There is no cookie approach to cure dementia but if you observe such changings or signs in your loved ones do not take it for granted before it gets too late. Wow,my husband in2014,was diagnosed with normal pressure hydrocephalus, VP SHUNT INSERTED INTO the skull and stomach, he became confused, agitated, at age 67, now 70 also is this a form of Dementia?